Designer Todd Oldham has a new fashion project: creative director for Old Navy. Oldham’s been doing all kinds of things for years, ranging from costume design to floral design to home furnishings design. But whenever I see his name, I get nostalgic for his supermodel-filled runway shows in the ’90s. I feel the same nostalgia for Isaac Mizrahi (now known primarily for TV and Target). And I really miss Christian Francis Roth (now doing juniors clothing, from what I can tell). Christian Francis Roth was the Zac Posen of his day, presenting his first collection in 1990 when he was barely drinking age. He became famous for his cheerful appliqued pieces, including a dress that looked like a box of Crayola crayons (yes, the crayon people sued) and the “breakfast suit,” which had a big fabric sunny-side-up egg on it. 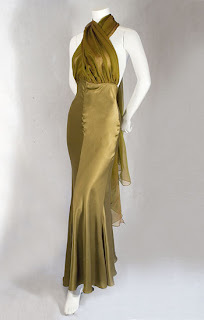 Roth closed his couture business in 1995. Mizrahi’s financial backer, Chanel, shut him down in 1998. Oldham closed his women’s business the same year. You can be as snooty as you please if you have a conglomerate like LVMH paying the bills. Marc Jacobs is financed by LVMH, and honey, those first two letters stand for Louis Vuitton. Marc makes so much money at Vuitton that he was able to wangle big bucks to support his self-named collection. A few years ago, he was also able to throw some work to Stephen Sprouse, the ’80s designer who managed to go out of business more than once. When you’re making a ton of money, you can get up on your high horse and make people wait for hours or whatever you want to do. But if you don’t have that kind of financial security, you better make an effort to encourage people to BUY things. Would I like to see someone like Cate Blanchett wear my work when she accepts an Academy Award? Yes! But when pre-rehab Lindsay Lohan wanted to buy my rings, did I say no? No way. Hell, anyone’s money is good with me. And lending is certainly not out of the question, as long as I get the pieces back (stealing is not acceptable!). Look, if Olivier Theyskens, formerly of Rochas, doesn’t want to play nice with influential stylist Rachel Zoe, that’s his decision. Just keep in mind that the line was shut down due to lack of business. Theyskens was adored by the fashion editors and seen on all the “right” people (a list that apparently didn’t include the rather fashionable Keira Knightley), but that didn’t keep him employed. A couple of years ago, Isaac Mizrahi reminisced about similar feelings during the height of his popularity. As he told my friend Teri Agins of The Wall Street Journal, “‘I used to think my job was about coming up with a new, bold, crazy look every six months, making something fabulous and pretty for my friends and the models. '” Many years later, having made a comeback at Target, his attitude had changed: “‘You’re not selling out, you’re reaching out,'” he told Teri. Of course, super-artistic people don’t start designing clothes because they’re dying to be at Target. And money isn’t everything, but do you really want to give up your dream job because you’re too precious to see the pop star du jour wearing your clothes? As Christian Francis Roth told the Las Vegas Review-Journal, “‘Not that money has ever been my motivation to do what I do, but there comes a time [when] you make a career on what has been a successful craft for you.” British designer Christopher Kane recently lucked out and had the best of both worlds: He refused to lend a dress to Victoria Beckham and she bought it, so he got prestige, press and payment all at once. Kane didn’t seem that thrilled with this outcome, but I would dance with joy if Victoria bought one of my pieces. I wouldn’t even ask her to return my 1995 hairdo. She’s working it. Posh, call me! If you want to get a taste of the good old days when designers thought money didn’t matter and models were glamazons who didn’t appear to need life support, you must see Isaac Mizrahi and the superest supermodels of all time in Unzipped. Enjoy! UPDATED TO ADD: It can be difficult to find any photos of vintage Oldham, Mizrahi and Roth online, but sometimes eBay pays off. 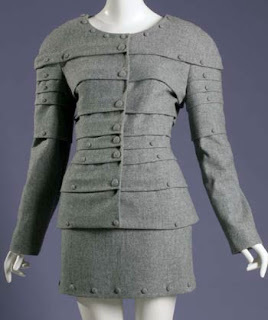 There’s a bottle-cap jacket by Roth up for auction this week! 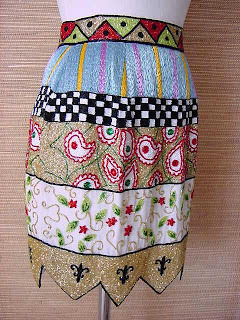 And here’s an ornate, beaded Oldham skirt. This eBay seller has an amazing selection of designer clothes. Holiday Video: Happy 4th of July! i love when i can be so fancy in a classy party dress! This is a Great post, with capital letters. Great post. It’s sort of funny, but totally true, to think that people who are SO current right now, whether they be actors or designers or whatever, might easily fade away into obscurity within the decade. Oldham has also been busy at the gym. We work out at the same facility — and even share a trainer — so I see Todd all the time. Lemme tell ya, when he’s not designing for Lazy Boy and Old Navy, the guy is working out. He’s really buff. Great post. As if I couldn’t be charmed enough by Oliver, the linked article made me even more enamored with him. I would never fault a designer for doing a collabortion with a Target, or H&M, etc. I think it depends on the level of involvement they have, instead of just stamping a name on just about anything. haha what a designer dog. yep, this is a great post. and damn, how much do i want an armor suit now?! Oooohhh – you give the best fashion DISH ever. LOL @ “Todd OldNavy”! Hopefully this will be a success for him. That Gap division has been struggling and all eyes will be on him! Pressure! I love that armor suit. For a split second, when I first opened your blog and saw Todd Oldham for Old Navy with the image of the suit, I thought that it was a proto-type of Oldham’s Old Navy line. I was completely blown away – all for a split second, before I came back down to reality and realized Old Navy could never sell something as amazing as Christian Francis Roth’s suit. Nevertheless, I’m looking forward to seeing what Todd will do with Old Navy – he does cheap well. great post, fabulous blog, and thanks for visiting mine! as a creative person myself, i have had the concern of “selling out.” but what does that really mean and who’s defining it? Really love that beaded skirt. What a work of art! Also the bottle cap jacket. Wendy, what do you think of Vera’s line for Kohl’s? I’ve only looked online and it seemed kind of interesting, but maybe not appropriate for the ladies who shop at Kohl’s? Anyhow, as usual, excellent post! You make learning fun! I think I am inlove with little Henry. Soooo cute. I must post pics of my kitties.